BALTIMORE (Stockpickr) -- October hasn't exactly been kind to stock investors. Since the start of the month, the S&P 500 has more than halved, shedding 3.5%. But while most stocks have been correcting hard this month, some corners of the market have started to look buyable again. For the last two weeks, the financial sector had led the rest of the broad market, outperforming more defensive sectors like consumer staples and utilities. And now, with earnings season fully underway, better-than-expected results among financial stocks are helping to propel this sector's outperformance even higher in the second half of the month. 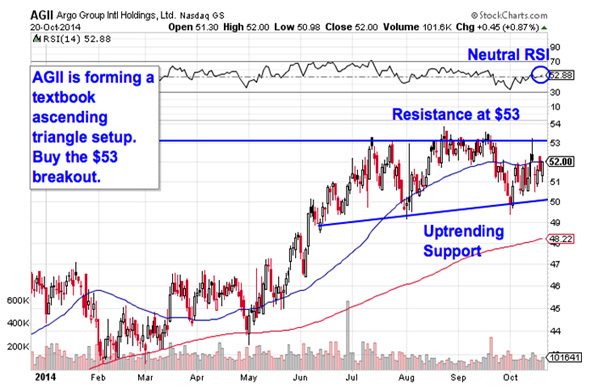 Today, we're taking a closer technical look at five big financial stocks that look like breakout buying opportunities in this market. We'll start off with the smallest name on our list: small-cap specialty insurance underwriter Argo Group International (AGII . This financial name may be small, but it's shown investors some big outperformance in 2014. Shares are up 12% since the calendar flipped to January. And now, AGII looks positioned for more of the same to end the year. AGII is currently forming a textbook ascending triangle pattern, a setup that's formed by horizontal resistance above shares (in this case at $53) and uptrending support to the downside. Basically, as AGII bounces in between those two technically-significant price levels, it's getting squeezed closer to a breakout above resistance. When that happens, we've got our buy signal. Momentum, measured by 14-day RSI at the top of the chart, hasn't been particularly useful in AGII over the course of this year -- but the fact that it's neutralized around 50 does indicate that this name can move materially higher before it starts to look overbought. Remember, buying AGII isn't a high-probability trade until $53 gets taken out. We're seeing the exact same setup right now in shares of Baltimore-based asset manager Legg Mason (LM - Get Report) . Just like Argo, Legg is forming an ascending triangle (albeit a less conventional-looking one) with resistance up at $52 and uptrending support to the downside. The push above that $52 price ceiling is our signal that it makes sense to be a buyer in LM. Why all of that significance at that $52 level? It all comes down to buyers and sellers. Price patterns like the ascending triangle are a good quick way to identify what's going on in the price action, but they're not the actual reason a stock is tradable. Instead, the "why" comes down to basic supply and demand for LM's stock. The $52 resistance level is a price where there has been an excess of supply of shares; in other words, it's a spot where sellers are previously more eager to step in and take gains than buyers are to buy. That's what makes a breakout above $52 so significant. The move means that buyers are finally strong enough to absorb all of the excess supply above that price level. Wait for $52 to get taken out before jumping in. Peruvian banking company Credicorp (BAP - Get Report) is another breakout trade that's lighting up our radar this week. After rallying almost 20% since the end of March, BAP has been churning sideways – but that sideways price action is the phenomenon that makes this stock tradable here. The sideways action in BAP is forming a rectangle pattern, a consolidation setup formed by a pair of horizontal resistance and support levels that basically "box in" shares between $147.50 and $160. Consolidations like the one in BAP are common after big moves (like the one that started in March); they give the stock a chance to bleed off momentum as buyers and sellers figure out their next move. From here, a breakout above $160 is the next buy signal on the way up – a violation of support at $147.50 means more downside risk suddenly looks likely. Because Credicorp's prior trend before it entered the rectangle was higher, a move through $160 looks like the more likely outcome for this stock. Berkshire Hathaway (BRK.B may have its hands in a lot of disparate businesses, but at the end of the day, insurance is Berkshire's bread and butter. That cash cow business have helped to propel this stock almost 16% higher in 2014, compared with a measly 3% return from the S&P 500 over the same stretch. From here, though, Berkshire looks headed for higher ground -- and you don't need to be an expert technical trader to figure out why. 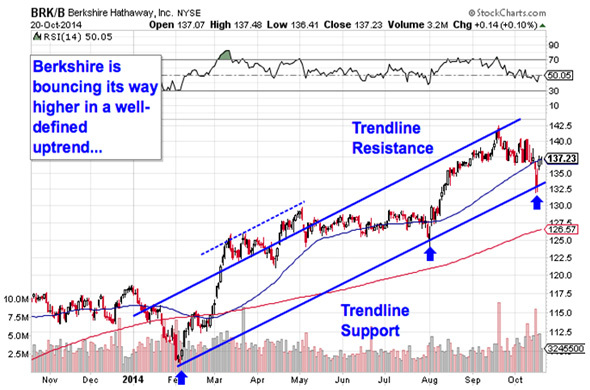 Berkshire has been bouncing its way higher in a well-defined uptrending channel since the start of February. That channel is formed by a pair of parallel trendline support and resistance levels that identify the high-probability range for shares to stay within. Put more simply, every touch of trend line support in 2014 has been an extremely low-risk opportunity to get into shares of Berkshire, and we're bouncing off of that level for a third time now. If you decide to be a buyer this week, I'd recommend parking a protective stop just underneath BRK.B's most recent swing low at $132.50. If that level gets violated, the uptrend is broken, and you don't want to own it anymore. Last, but far from least, is Citigroup (C - Get Report) , a mega-cap banking name that's showing us the exact same trade as Berkshire Hathaway this week. At first glance, Citi's chart looks a bit haphazard. This stock has been all over the place over the course of the last 12 months. But since mid-April, Citi has taken a more orderly approach, and caught a bid along the same exact support line five times now. Don't let September's bull trap distract from support in Citi -- that's the line to focus on in October. So, with shares catching a bid at that level this week, it makes sense to buy this bounce. Waiting for a bounce off of support is a critical test for two big reasons: It's the spot where shares have the furthest to move up before they hit resistance, and it's the spot where the risk is the least (because shares have the least room to move lower before you know you're wrong). Remember, all trend lines do eventually break, but by actually waiting for the bounce to happen first, you're ensuring Citi can actually still catch a bid along that line before you put your money on shares. 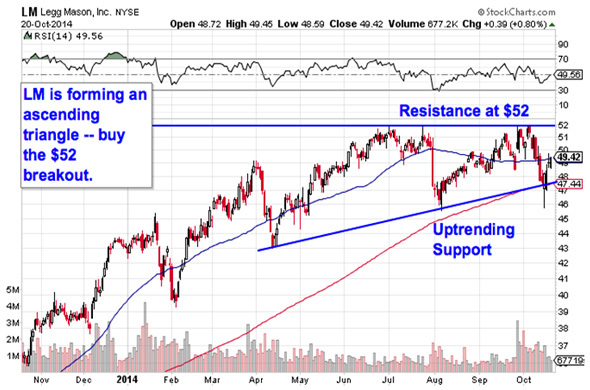 Relative strength is our side-indicator in Citigroup right now. While our relative strength line started 2014 in a downtrend, it reversed course this summer, indicating that Citi is now consistently outperforming the rest of the market. 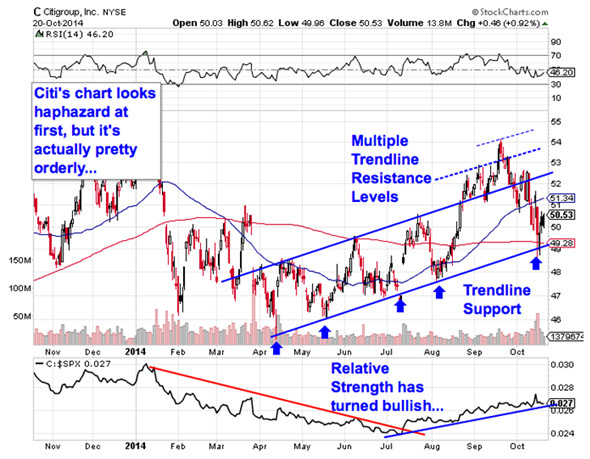 As long as that uptrend in relative strength remains intact, Citi should keep outperforming the S&P. 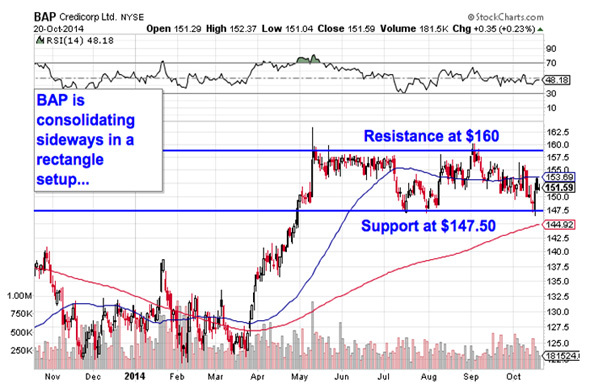 To see this week's trades in action, check out the Must-See Charts portfolio on Stockpickr.